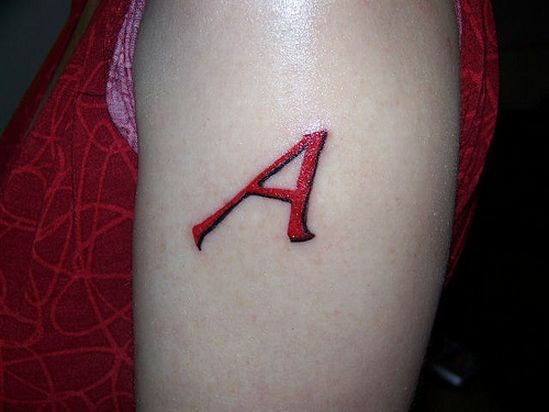 Ok, so the origins of this scarlet âAâ tattoo remain shrouded in mystery with a number of bloggers offering a number of interpretations for it. One dude thinks it represents oneâs atheist outlook while another suggests that this is a symbolic reference to the novel The Scarlet Letter written by American novelist Nathaniel Hawthorne. Though I personally think it is just the initials of the lady (?) who got it, or even the initials of her dog since it would be mighty crazy to get just a letter inked on your skin without any real reason. But itâs a crazy world and anything goes, so I wouldnât be at all surprised me if this lady (?) were to mail me the real âmeaningâ behind her âAâ tattoo someday. Lemme know what you all thought of this obscure ink.